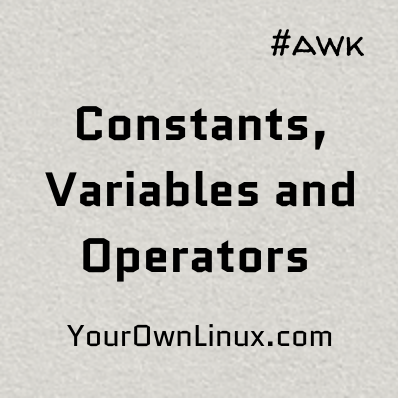 AWK Programming Tutorial - Constants, Variables and Arithmetic Operators ~ Your Own Linux..! 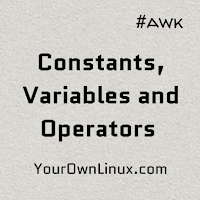 Constants, Variables and Operators in Awk : So far in this tutorial series on awk programming, we have learned to print stuff, we learned about fields, records and delimiters and how to they are referenced. These are very basic operations as we are just extracting data from input lines and printing them. Now, we move a step ahead and manipulate the extracted fields by performing some common arithmetic operations on them. Before we proceed, I recommend you to please go through the third article published on awk - Field separator and Field references. A string constant is always surrounded within quotes, e.g. "Pineapple", "5_days", etc. String can use escape sequences like \n ( newline ), \t ( horizontal tab ), \b ( backspace ), \v ( vertical tab ), \" ( double quotes ), etc. A numeric constant is a number without quotes, enough said. A number enclosed within quotes is considered as a string. A variable is an identifier that references to the memory location that stores a value. We can initialize a variable by assigning a value to it, using = operator, e.g., age = 20, firstName = "Eric", etc. Here, age and firstName are variables. A variable name consist of alphabets, digits and underscores, and it must start with a letter or underscore. Variables are case-sensitive. It means, Age, age and AGE are different variables and they can store different values in them that won't get overwritten. Variable initialization is optional. If we do not initialize a variable, awk defaults the value to numeric 0 or a blank string ( "" ) appropriately. We can assign a field value to a variable using field reference variables $1, $2, etc. # Space concatenates the strings, so 'myVar' stores the value "AwesomeAwk!" Below example shows how we can define a variable and perform arithmetic operations on them. This way, we will get the similar result from print statement. But, the value stored in variable salary remains unchanged. If we were to update the variable salary with the added value, we can use assignment operator +=, that combines 2 operations, addition and assignment. So, we have the number 25000 added to the value stored in salary and the result of addition is again stored in the variable salary. To demonstrate this, we can use /etc/passwd and count the number of lines in it. For this, we initialize a variable x and increment it after every line is read. After the last line, we print the variable, which gives us total number of records read by awk. We can also include a condition here, to print the count of lines those have the string bash inside them. Another example. This time, we use a demo file which has 3 fields - Name of the student, Subject name and the Marks. Below is the snippet. That's all for the scope of this article. We did not cover all of the operators here as there are pretty straight forward and most of you may already have an idea about those ones. Let me know about your views and feedback in the comments section below and stay tuned for more articles.